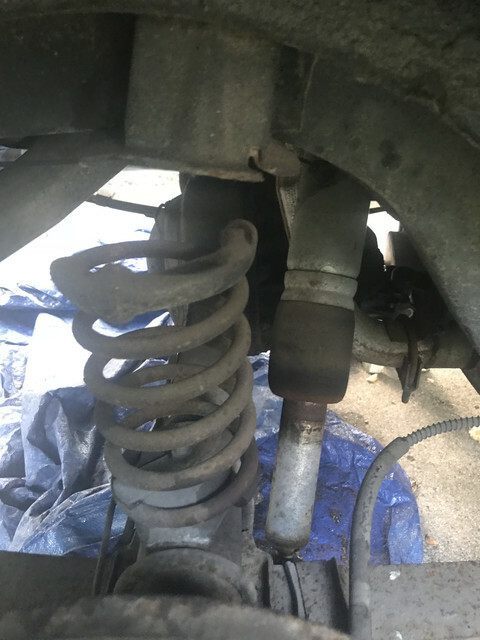 i been trying to find some rear spring for my fastback, but don't seem to be any, I do have leaf spring and coil spring in the rear. Rear leaf springs are available from any Mustang supplier. Eaton spring supplies the most accurate reproductions, but they are more expensive than a standard style replacement. Since you have a '73 Mach, you have competition suspension, which utilized a 138 lb/in rear leaf. I've used the 71 429CJ spring in several cars with excellent success. I also recommend you replace your u-bolts and rear shocks at the same time. That's not original. Looks like a J.C.Whitney overload, add-on, special. With the correct leaf springs you'll be able to throw them away. Holy crap! overload springs AND air shocks! Did the PO use your car as a dump truck? Throw all that crap away and get a proper shock. You're missing the axle bumper int he bracket. With the correct springs you won't need them. Hard telling what they were carrying that needed that extra weight capacity, but if it were me, I would check every nook and cranny, especially the drop-offs in the trunk, for leftover contraband.